A very small number of birds, including Woodpigeon, produce 'crop milk', a substance similar to mammalian milk in its composition. As the name suggests, the milk is produced in the crop, a sac-like structure normally used for storing food. 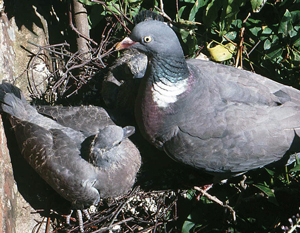 In Woodpigeons, some of the cells in the crop wall begin to produce milk during the final few days of the incubation period. The fluid-filled cells containing the crop milk are sloughed and it is these that will form the only source of nourishment during the chicks first few days of life. Interestingly, the type of nourishment provided by crop milk in doves and pigeons is very similar to that provided in the egg to the developing embryo before hatching. The production of crop milk is also known to occur in Emperor Penguins and Greater Flamingos, suggesting that the trait has evolved separately on more than one occasion.